If you enjoy a deep ballad with an evocative melody, you will love this album. If you like fun and inventive be-bop lines and thoughtfully-phrased and rhythmically-layered runs up and down mega-octaves, you will also love this album. 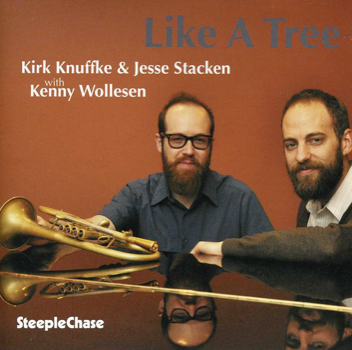 No matter your mood, Jesse Stacken, Kirk Knuffke and Kenny Wollesen deliver a well-rounded assortment of choices, and all without one cliché! The fact that this album is comprised of covers (C. Bley, S. Lacy, Coleman, Coltrane, Albert Ayler, Julius Hemphill and Misha Mengelberg) deepens the metaphor: these glorious branches simply could not exist without a thriving network of hidden roots and ancestry. One of the most interesting elements of the partnership between Stacken and Knuffke (who have been playing together since 2006), is their creation of the third body. In addition to the obvious (living entities created in the ether via musician empathy and non-verbal communication), these two take the concept further. 1) live or recorded, Stacken’s left hand literally becomes a living, breathing bass player. 2) structurally, in melody and during solos, a third pianist often appears with Knuffke as the Right Hand and Stacken’s right hand as the Left Hand. None of this is done with smoke and mirrors or slight-of-hand. It’s just their natural way. As for the cornet, Knuffke’s tone on his specially designed instrument is like a treasured taste of butter-cream caramel frosting warmed ever so slightly at a comfortable room temperature. Oh, man! And his phrasing is so pleasing: his inventiveness is in the best of the be-bop tradition, but with no staccato shrillness or ego-driven antics. And the way he sounds like a human voice for a moment on “Art” – riveting…. As for Stacken, I’d like to return to his independence between hands. His level of mastery here allows him to burst into several layers of terrain at once, yet, somehow this is not confusing nor difficult to listen to. Melodic, syncopated, rhythmically adventurous, filled with space, filled with sound….he’s not afraid of the highest nor lowest notes. And on this album, Stacken ends several tunes with the lowest registers allowed to ring out and out. Nice! Wollesen is a great choice of drummer for these two. Wollesen is consistent, and he’s got a lot of secret ways of getting extremely specific vibrations out of hammered metal disks. He is somehow focused on playing where the ringing ENDS and getting vibrations to stop at nano-rhythmic intervals. I don’t know how he has developed this extensive repertoire of individualized sound-style, but it is incredible. Wollesen has a lot of guts to take on “Saturn” and handles the tune adeptly. And, of course, as you all know, the man can swing like nobody’s business. This is great CD to give someone for Valentine’s Day! Bundle this gem with a dozen red roses and a poem, and you will have a nice year with your honey. Trust me.